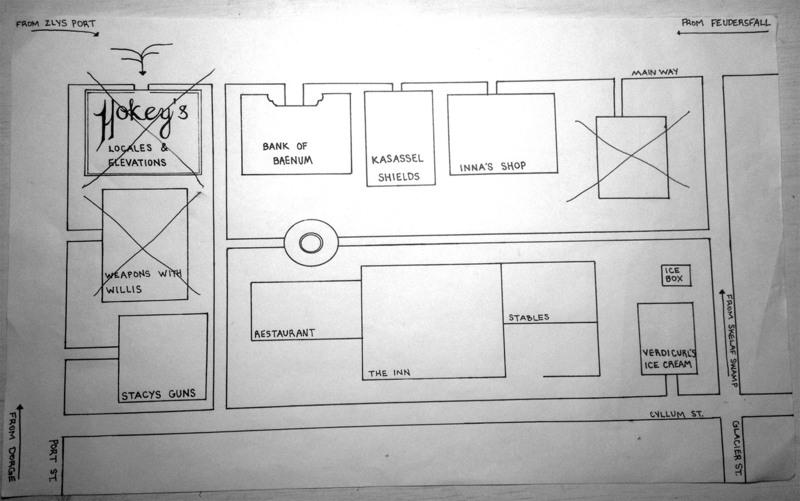 Baenum Bandits: Diagram of a Heist – GHOST PARTY! 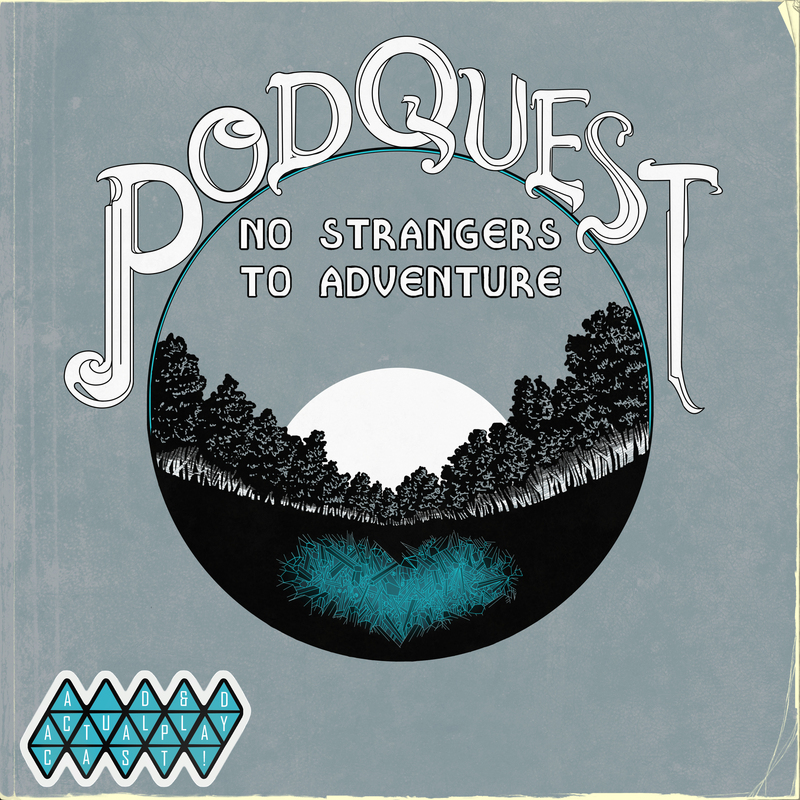 This post contains photos that cover the chapter Baenum Bandits of our podcast Podquest: No Strangers to Adventure! If you haven’t listened to Part 11 of this chapter, reading further may spoil things! 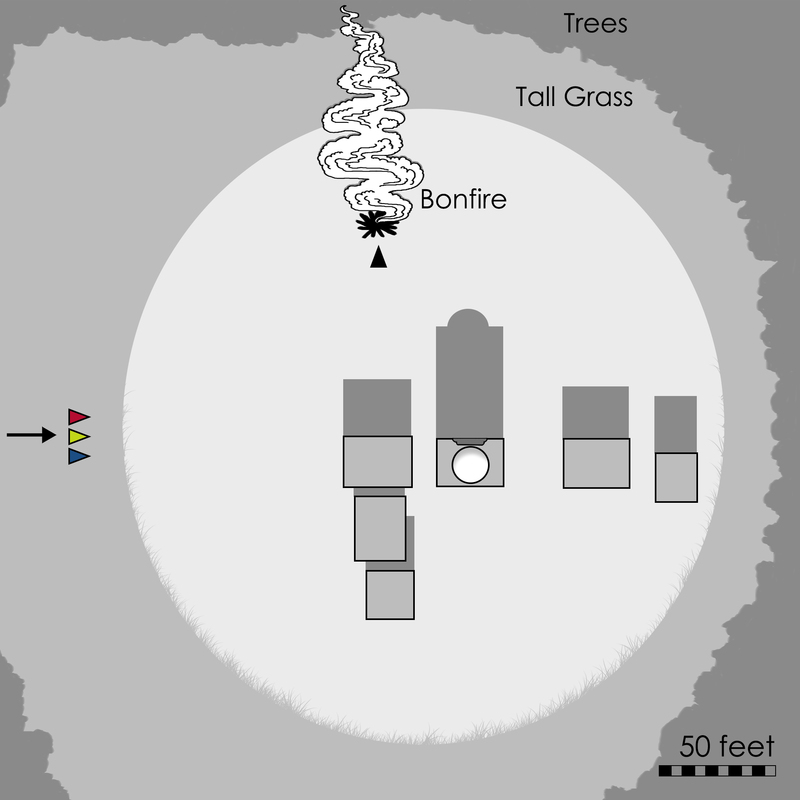 The above image is a diagram of the clearing the party found themselves in after following the Bag Man’s trail from Sludge. 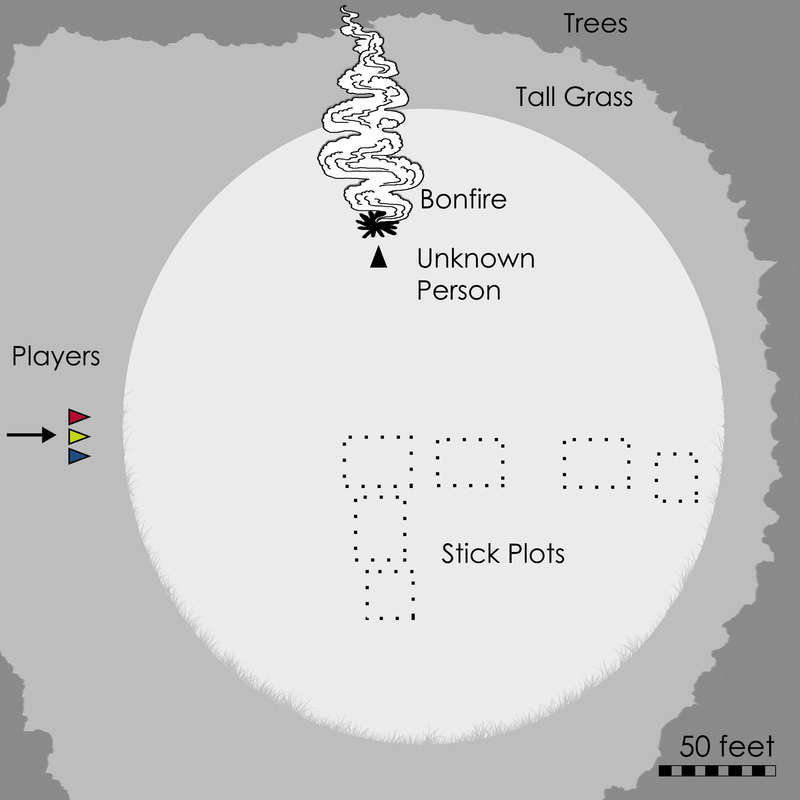 Crouched in the tall grass, Giacabo, Digby, and Gnoman see to their left a blazing fire and a figure a little too far away to identify, and straight ahead a plot of sticks standing up out of the dirt. So, who’s the unknown person, and what do the sticks mean? If you’ve been following along to the chapter, you might have your suspicions. Let’s look back at Hokey’s Business Card. Since arriving in Baenum, buildings have gone missing in one of the town’s blocks. First, the map maker, Hokey, lost his business/home, then the weapon shop and the enchanter’s home went missing. 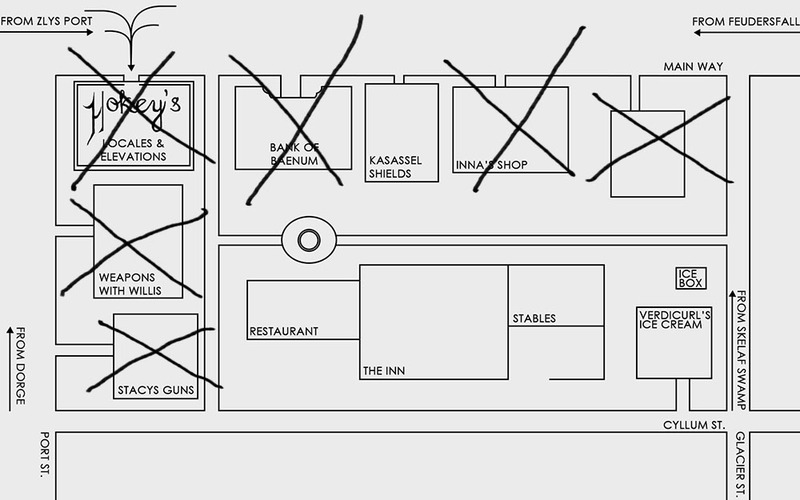 After gathering at The Inn, three more buildings went missing: Stacys Guns, Inna’s Shop, and the Bank of Baenum. After following a secret tunnel under the bank, breaking into a farmer’s home, fighting at the lake, and gathering intel at Sludge, the party deduced not only how these buildings disappeared, but where they would show up. That’s right. Take another look at the first diagram of the clearing. As the characters watched on, between the sticks, little buildings grew, from doghouse to shed to full-sized. Each missing building from Baenum is here, in the same set-up as the block they disappeared from. This must have taken high-level magic and a cunning plan to execute. And all for what? The party hopes to find more answers by capturing Bag Man, but will he spill the beans? Find out as the Baenum Bandits chapter nears it’s end! I hope this helps inform your mind’s eye as you listen along!